When it comes to grooming, men aren’t always known for their cutting edge gadgetry like women usually are—what with eyelash curlers, toothbrush-esque face scrubbers, and countless other contraptions. That said, there are some gadgets out there for men that we simply can’t believe exist. Whether helpful, crazy, or a little bit absurd, we love the innovation behind these items. Check out our top picks for the best men’s hair gadgets. It seems like it’d be much easier just to walk on down to the barbershop, but some men are staunchly DIY in the beard realm. This expensive beard trimmer has a laser built into it, and projects a guideline across your face as you trim. A bit over the top, perhaps, but if it gets the job done, who are we to judge? Sick of hearing complaints about leaving hair in the sink when you shave? You’ll love the Beard Bib. It fits over your head like a t-shirt, then suctions to a mirror or wall in front of you, extending a hammock-esque cloth in front of you to catch the clippings. You’ll never have to painstakingly scrub the sink again. 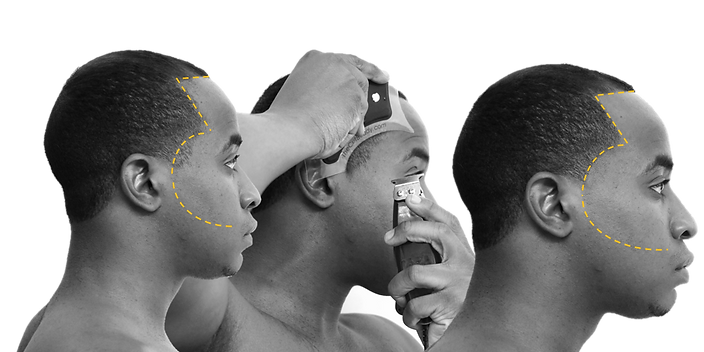 The Cut Buddy is another product that helps you line up your beard. It’s a bit strange. You put the plastic up against your face, and shave along the curves. It’s an easy way to ensure that your beard is the same shape and length on both sides, but we have to say, it’s still so much easier to just visit your barber for the job. Forego your regular haircuts and instead, pick up Even Cut Clippers. It looks a bit like a dish scrubber, but works similarly to standard men’s clippers. We understand the concept for those men who keep their hair at the lowest maintenance style possible, but for anyone else, this wouldn’t be the best idea. Thinning hair got you down? We can’t vouch for its efficacy, but the Laserband 82 claims to deliver laser light to increase your hair’s growth. Its unique cradle design uses 82 medical grade lasers to energize and revitalize your hair follicles. Treatments take as little as 90 seconds. When you want to look great without having to dole out tons of cash for ineffective gadgets or weird tools, come in to State Street Barbers. We have four convenient locations, and our experienced stylists and barbers will help you look your best. If you’re looking for the best haircut in Chicago, visit our Lakeview, Lincoln Park, Old Town, or River North shops today, or call to make an appointment anytime.